Woody’s Diner serves up classic comfort food, like the dishes displayed here by (from left to right) managers Kate Myers, Stephanie Swain and Adrian Sapiens. Among those who have visited the new Woody’s Diner in Orange is a man who works right across the street: Rev. Tim Klinkenberg, senior pastor of St. John’s Lutheran Church. He gives the restaurant a big thumbs-up. “I’ve eaten at Woody’s a number of times and love it. I really like the diverse menu, the location is so close to my work and the service is first-class,” says Klinkenberg. The eatery, which opened in late July, is the sixth Woody’s Diner in Orange County. Four of the other five are along the coastline, with locations in Newport Beach, Sunset Beach, Laguna Hills, and two in Huntington Beach, where the first Woody’s opened 30 years ago. The Woody’s menu is full of American comfort food: omelettes, biscuits and gravy, hamburgers, hot dogs, chili, and desserts that include hot fudge sundaes, malts and root beer floats. Most of the breakfast items are served all day. The classic diner fare is complemented by a casual, comfortable atmosphere. Woody’s also prides itself on its reasonable prices and friendly staff. “We have great customer service,” says Erik Johnson, owner of the Woody’s Diners, adding that the restaurants get a lot of repeat business. One of the biggest assets of the Orange site, he notes, is its 50 parking spots. The restaurant, which seats about 150, has a full bar, though Johnson stresses it won’t be a late-night establishment. There are about 10 televisions around the eatery, and Johnson hopes televised sports events will be a draw for the locals. “It’s a place where college kids or guys in the neighborhood can walk down to watch the game,” he says. 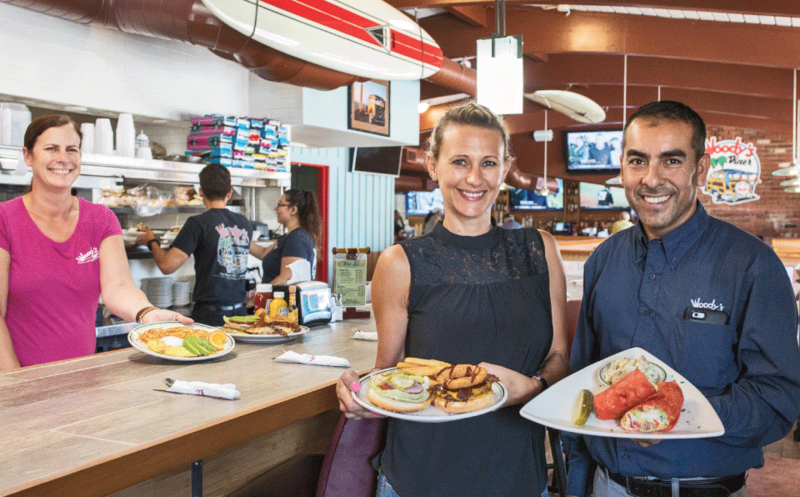 Adrian Sapiens, a longtime Woody’s manager who oversees operations at all its diners, says the reception to the Orange diner has been “exceptional,” with the restaurant receiving great feedback and even more customers than expected. He and Johnson say its food and atmosphere are a perfect fit for the Old Towne neighborhood.